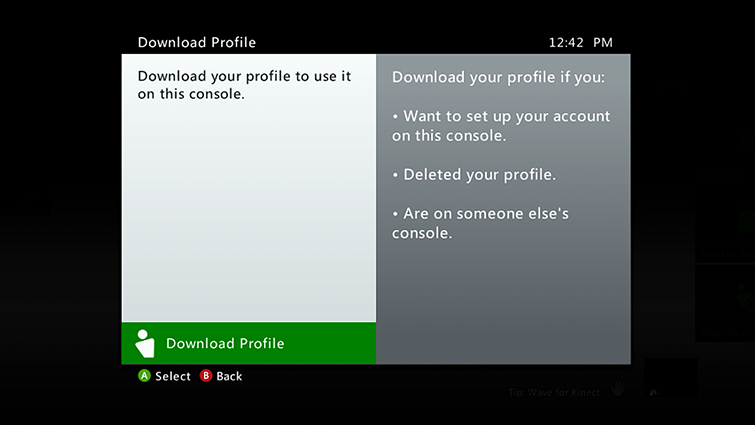 You can easily add or remove your Xbox profile on any Xbox 360 console. See the steps on this page to find out how. Note Your Xbox profile is the same for both the Xbox 360 and the Xbox One console. You may want to use your Xbox profile on a friend’s Xbox 360 console for multiplayer gaming, or to re-add it because it was accidentally deleted from your own console. You can also remove it from another Xbox 360. Press the Guide button on your controller. Note Not seeing Download Profile? This means that you’re signed in under another profile. Press the X button on your controller to sign out, confirm, and then select Download Profile. At the bottom of the Download Profile screen, select Download Profile. Enter the email address of the Microsoft account that’s associated with your Xbox profile. If you don’t know it, see the Lost Account Solution. Enter your Microsoft account password. If you’ve forgotten it, you’ll need to reset your password. Note If you have a child account, your parent’s Microsoft account information is required to download your Xbox profile on the Xbox 360. If you use external storage on your console, select the storage device on which you want to save your Xbox profile. If you don’t use external storage, your Xbox profile will begin downloading. 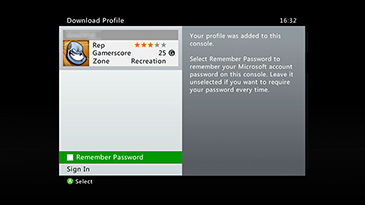 After you download your Xbox profile, you’ll be asked if you want the console to remember your password. If you want to sign in without being prompted for a password each time, select the Remember Password option. Keep in mind that when you choose this option, anyone who uses your console can sign in as you and use your account information. This includes any credit card information you might have saved. Leave the Remember Password option unchecked if you want the console to require a password to sign in to your account. This is a good idea if others in your home can easily access your console, or if you downloaded your Xbox profile at a friend’s house. Important If you downloaded your Xbox profile to another console and you chose the Remember Password option, you can remotely remove the password so that your Xbox profile can’t be accessed by someone on the other console. To learn how, see Manage your sign-in preferences on your Xbox 360 console. Go to settings and select System. Note If you don’t connect any external storage devices to your console, select Hard Drive. If you do use external storage, select All Devices. Select the Xbox profile that you want to delete. 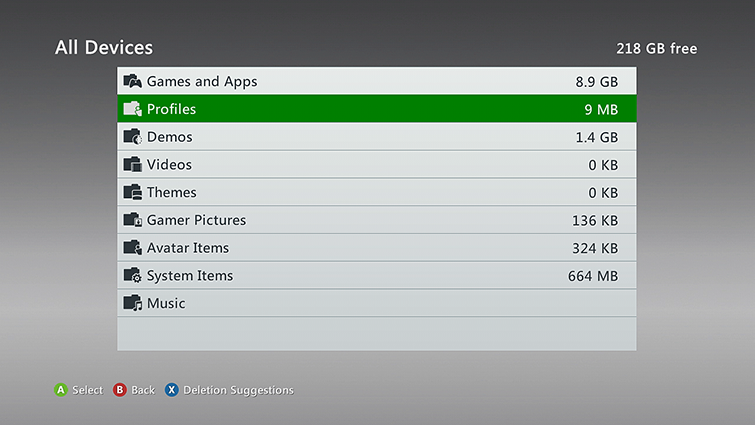 Delete Profile Only – This deletes the Xbox profile but leaves saved games and achievements. Delete Profile and Items – This deletes the profile and the associated saved games and achievements. Would you like to contact Support regarding the "How to add or remove an Xbox profile on Xbox 360" issue you were reading about or a different issue?